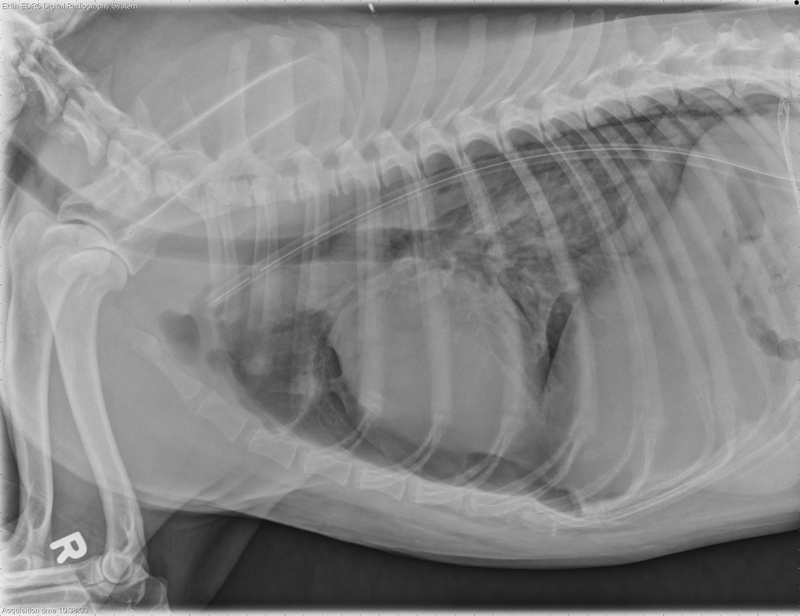 Today’s case is an 8 year old male neutered Siberian Husky thatÂ was hit by a car several hours ago. Take a look, post your interpretations in the comments and vote in the poll! You only really learn when you commit to an answer, so here’s your chance before checking the answers below. A chest tube is present terminating at the level of the first rib in the left cranial lung fields. Pneumothorax is present, worse on the right than the left. Pneumomediastinum is also evident, particularly caudally. Two bullae are identified in the left caudal lung lobe, best seen on the right lateral projection and the v/d projection (see annotated figures). There is an interstitial to alveolar pattern in the left cranial and left caudal lung fields. Additional radiographs were taken two days after presentation. The pneumothorax has resolved, and the chest tube remains in place. The more dorsal bulla is filled with fluid and appears as a solid soft-tissue opacity. The more ventral bulla has a thick, irregular wall. These changes indicate filling of the bullae with blood or inflammatory fluid. The dog was discharged the next day after removal of the chest tube and was doing well. In both lateral view the heart s elevated from the sternum, but on the RL view there are pulmonary markings under the heart while on the LL view there aren’t any, therefore I think it’s a unilateral pneumothorax. It’s not tension pneumothorax because then I would expect the heart to shift away from the pneumothorax on the DV view in the case of a tesion pneumothirax. Also there is a diffuse interstitial to alveolar infiltrates, more severe on the L side, most likely due to lung contusions. And I think that the pneumothorax is on the R side because of lack of peripheral pulmonary marking on he DV view. Since the chest tube is on the left side my guess is that these rads were taken after the air from the L side was removed? there is some subQ emphesemia on the left side in the VD view (caused by chest tube placemend?) VD also looks like caudal lung lobe is collapsed and separated from chest wall on the rt side. I don’t seeany obvious rib fractures. 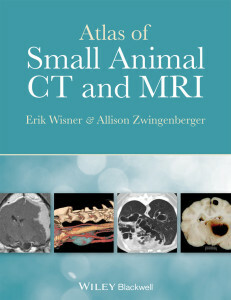 air pockets are preset at the cranial margins of both diaphragm crura. problems with the sternebrae? 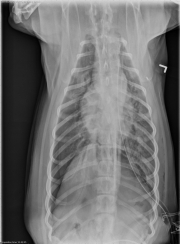 The pneumothorax is mainly in the R side as it is apparent on the VD and LL view. 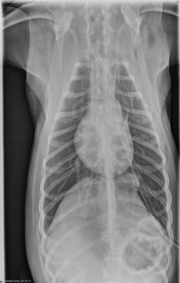 Literally the pneumothorax is bilateral because there is a small radiolucent, oval area (air) superimposed on the 10th rib at the lefth side of the thorax in VD view, propably due to thoracocentisis. 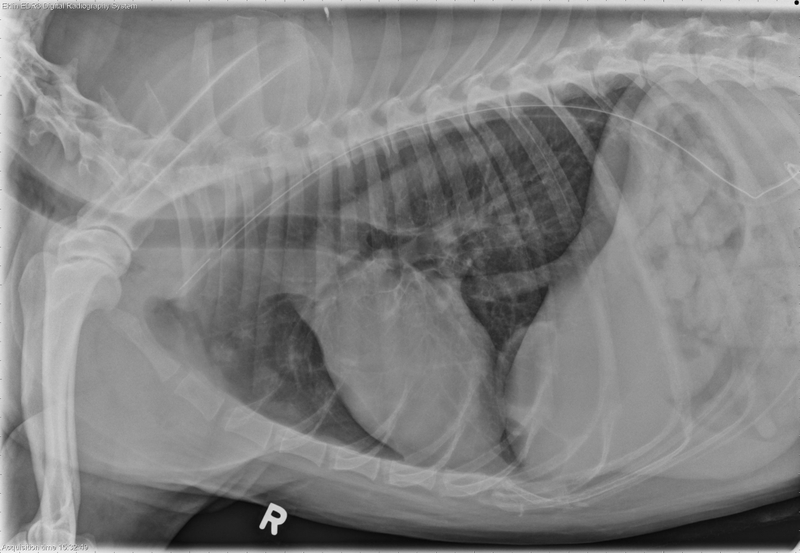 Usually pneumothorax is bilaterall in dogs and cats because of communication between the two hemithoraces, thus I make the thought that during the procedure part of the air in the lt pleural space was removed and what is left is mainly in the Rt side now. Moreover the opacity of the L lung is higher than the R lung despite that atelectasis should be more severe in the R side (due to pneumothorax). This indicates that the patchy alveolar pattern in the L side is more hemmoraghe than atelectasis. So slightly more than half of voters thought the pneumothorax was bilateral. If you look closely at the d/v projection, the lung margin is visible separate from the chest wall on the right side. It’s not as obvious on the left, but there are no vessels or bronchi visible caudal to the chest tube. The pneumothorax is bilateral. 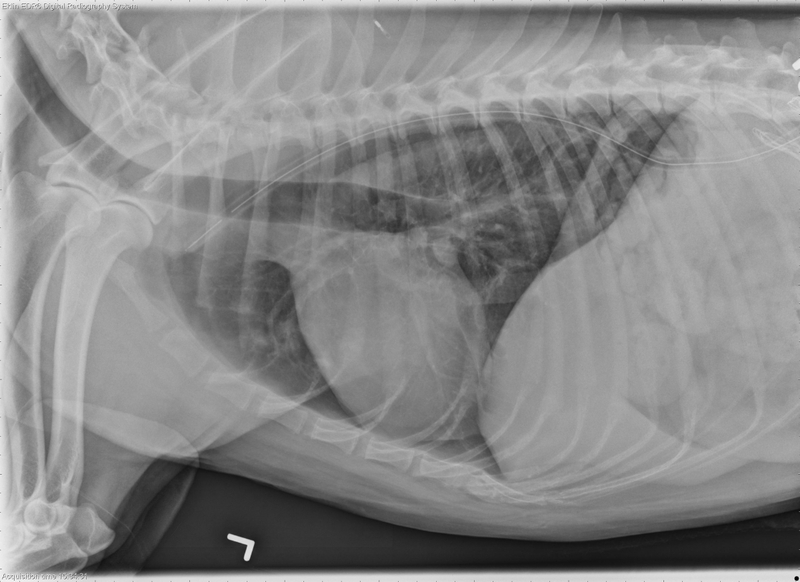 Vet74 made a good comment about checking for tension pneumothorax. In that case one hemithorax keeps filling with air through a one-way valve effect, and causes collapse of the lung on that side as well as the opposite side. The mediastinum would be shifted away from the tension pneumothorax. 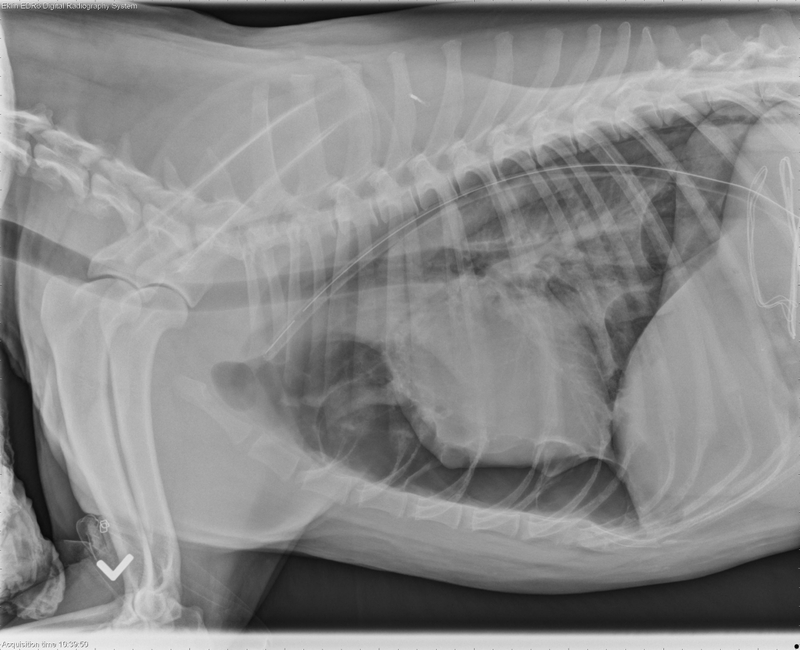 Both vet74 and ringo noticed the increased opacity of the lung on the left side, despite it being less collapsed than on the right. That means there is excess fluid in the lung, most likely contusions from the impact. There’s one more important finding that ringo alluded to. Hint: look at the d/v projection on the left.